The Teatro La Fenice in Venice: entrance fees 2019, sightseeing, guided tours and opening hours of the famous Venice Theatre and Opera House. On this page you will find all the information for a visit to the La Fenice Theatre in the heart of Venice. The article is aimed especially at tourists who are visiting the magnificent opera house for the first time. La Fenice is a theatre with boxes on 5 floors. According to many visitors it is one of the most beautiful operas in the world. The two dominant colours are red and gold. Under the boxes there is a large auditorium with seats. Since the modern reconstruction after the fire the theatre has changed a bit. Nevertheless, much of the old splendour can be seen again. According to many visitors, the acoustics in the Teatro La Fenice are even better than before. The theatre La Fenice is located in the heart of Venice about 300 meters west of St. Mark's Square. The Rialto Bridge is about 500 meters from the Opera House. For example, Rialto in the north and S. Marco (Vallaresso) in the south are close to the public vaporetto boats. The fastest way to get to Rialto from the train station is to take line 2 to Rialto on the Canal Grande. The opera house La Fenice is only a stone's throw west of St. Mark's Square. The Teatro La Fenice can also be visited without an opera performance. On most days the opening hours are from 9:30 to 18 o'clock. However, from time to time there are also performances at the opera La Fenice, which start earlier and take place during the day. Then, of course, a visit to the Gran Teatro La Fenice is not possible. Admission without performance costs 10 Euro. If you are over 65 years old or a student under 26 years old, you pay a reduced entrance fee of 7 Euro to the La Fenice Theatre. A family ticket with 2 adults and one child costs 23 euros, with 2 children 26 euros and so on. Those who pay for admission get an audio guide free of charge. These are available in various languages, including German. There are also guided tours through the Teatro (see below). Included in the entrance fee of the Teatro La Fenice is a small exhibition about the famous Greek-American opera singer Maria Callas (1923 to 1977, soprano). Also the theatre La Fenice is, like practically all sights in Venice, quite crowded and there are long waiting times at the entrance. This is especially true for entrance without a performance during the day (theatre visit). The number of visitors is limited. Therefore, one should consider to buy a ticket for the Teatro La Fenice in advance on the internet in order to avoid long waiting times. The whole thing is called "ticket without queue" or international "Skip the Line Ticket". 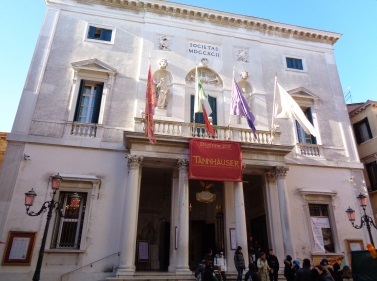 There are also guided tours of the famous theatre of Venice. To our knowledge only in Italian and English. These cost 20 Euro including admission. The guided tours have good reviews and last one hour. One should book such a tour in advance. The recommended theatre tours can also be booked online at Getyourguide.de. Our recommendation for those who understand English or Italian well and are interested in the famous theatre of Venice. You will learn a lot about the history of the opera house, about the performed operas and world premieres and of course about the magnificent building in the middle of Venice. In the great opera house of Venice, of course, there are frequent performances. Mostly there are well-known operas on the repertoire. Admission prices are often over 100 euros. It is better to book well in advance. You should pay attention to the dress code. Some events can even be attended with jeans, for some other performances even the (black) colour of the clothes (ladies and gentlemen) is prescribed as far as we know, including tie etc. Stricter clothing regulations apply, for example, in the opening season and at premieres, but it is usually relaxed at afternoon performances. Even in February there was a queue. After we had paid the entrance fee of 10 Euro per person, we went up the stairs behind the visitor entrance. A box on the 2nd floor of the five-storey opera house was open. Here we could sit down and have a look at the beautiful theatre as long as we liked. We could not enter the lower part of the opera house. Here was a meeting with a test of the lighting. But we could listen and understand almost every word because of the good acoustics. Strangely enough, most of the meeting was in German. A little bit disappointed we were from the permanent exhibition about Maria Callas, not much more than some photos and pictures. Furthermore you can see some other rooms of La Fenice like changing rooms, common rooms of the actors and so on. The cafe of the opera is also open during the day. Even for Venice the cafe is not exactly cheap, a small Coke costs for example 4 Euro. As almost everywhere in Italy, at least the Expresso is not expensive (2,20 Euro). At the exit, one walks through a small shop in which mainly books about the theatre La Fenice and other sights in Venice are sold. It was a pity that we could only see the theatre only from one point. But in our opinion it was still worth it. There is no time pressure inside the theatre. It is really beautiful. Once in a lifetime we could see one of the most beautiful opera houses in the world. Besides the famous opera Scala in Milan, it is probably the most beautiful and best-known opera house in Italy. In the Gran Teatro La Fenice Venezia, many world-famous operas were premiered, including operas from Verdi, Rossini and Bellini. On the way, you pass another art museum of world level, namely the Museo Galleria dell Accademia, right after the Accademia bridge. (Admission also about 15 Euro, children under 18 years free). The La Fenice Theatre is also not far away from the tourist heart of the city with the famous St. Mark's Square and its big sights (distance about 200 to 300 meters). Also the Venice Hard Rock Cafe ist about 200 Meter from the opera house Teatro La Fenice.